While the president is be staying behind in Washington DC to deal with the government shutdown, Kimberly Guilfoyle is making herself at home in Mar-a-Lago to celebrate her first Christmas with the Trumps. The former Fox News host took to Instagram to post photos of herself, new beau Donald Trump Jr and the president at the White House as she reflected on her 'many blessings' from this year. 'Merry Christmas and #HappyHolidays to you and your loved ones ... reflecting on all of our many blessings and so grateful Wishing you healthy and Happy Holidays! God Bless you and your families!,' she wrote. 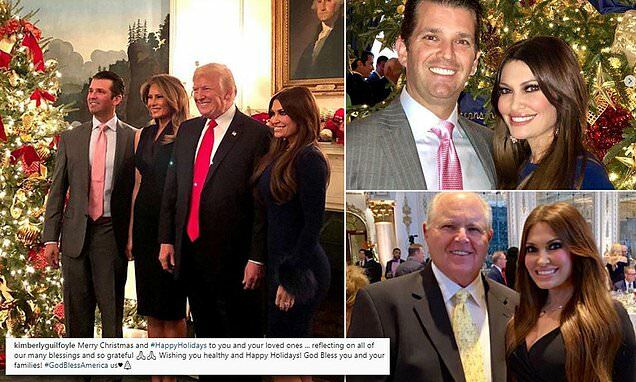 Some of Guilfoyle's snaps included photos of her and Don Jr taken at last week's White House Christmas Party, which saw Trump officials - past and present - in attendance. The couple also attended the DailyMailTV and DailyMail.com Holiday Celebration in New York City earlier this month where they revealed they'd be spending the holidays together. The couple kicked off their holiday celebration last month, when they were in Washington DC at the White House for the National Christmas Tree Lighting.